Have you started thinking about creating your Christmas cards yet? Heartfelt Creations makes is easy to create some beautiful cards with the release of their new Christmas Cheer Collection! This collection features 14 new precut stamp sets that coordinate with one new exclusive Heartfelt Creations Die manufactured by Spellbinders, there are also images that coordinate with existing Spellbinders dies. Leave a comment on the Heartfelt Creations Blog by September 20th for a chance to win the entire release valued at $240.00! The new Script Christmas Tree makes is easy to create your holiday cards! Here, I kept it super simple, by inking the image with a Spectrum Pad. 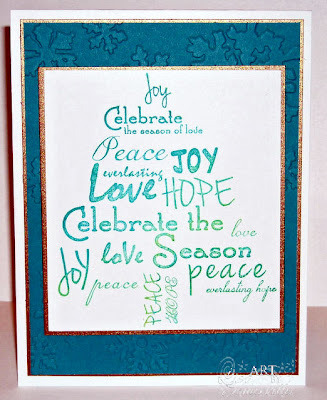 This stamp coordinates with Spellbinders Holiday Tree Shapeabilities 2010 Die. 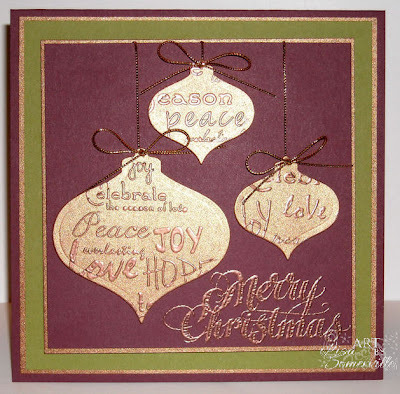 For more inspiration using the new Christmas Cheer Collection, be sure to stop by the Heartfelt Creations Blog to see what the other designers created this week! Beautiful cards, Lisa! Love the embossing! Love the copper ornaments and the embossing you did on them! Super Christmas cards - I do like the baubles with the text finish - they look fab! Very nice cards! Love the first one, so elegant! Gorgeous cards, Lisa! Love the use of the Script Christmas Tree!!! I have to admit, Christmas cards are coming hard for me in the heat we have had this summer. I'm slowly coming around...yours is totally gorgeous and seem to be effortless for you. Beautiful cards! I love the ornaments card. Beautiful cards Lisa! I especially like your ornaments card.